Could you use a little more action and intrigue in your life? 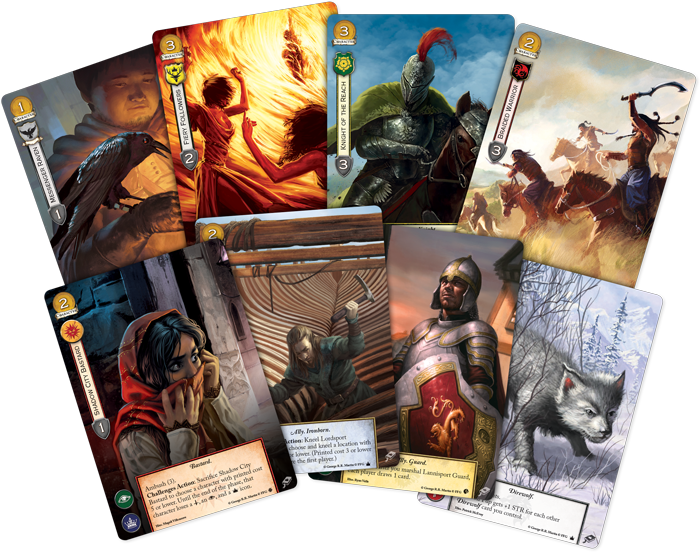 Have you been thinking about getting into A Game of Thrones: The Card Game? Or have you been recruiting new players and you're looking for a better way to teach them all of the game's battles, bribes, and backstabbing? If so, your chance is nearly here! We'll soon see the release of eight new Intro Decks, playable right out of the box, that offer the perfect means to raise your banner and support your favorite faction. And we're going one step further—after these decks find their way to your favorite local gaming store, you'll be able to explore and enjoy them later this year during a special A Game of Thrones: The Card Game Intro Event! The A Game of Thrones: The Card Game Intro Event is the perfect time for you to leap into the battles raging all across the Seven Kingdoms. If you're a new player, you can pick up the Intro Deck for your favorite faction and find someone to teach you the game. If you're a veteran, this is a great time for you to help educate these newer players and help them learn not only the rules, but lead them to an understanding of what the game is all about. Either way, when you show up, you'll receive a double-sided faction card designed to lead you deeper into the event. On the front, you'll have your faction card, with a stunning take on one of your faction's most notable characters. 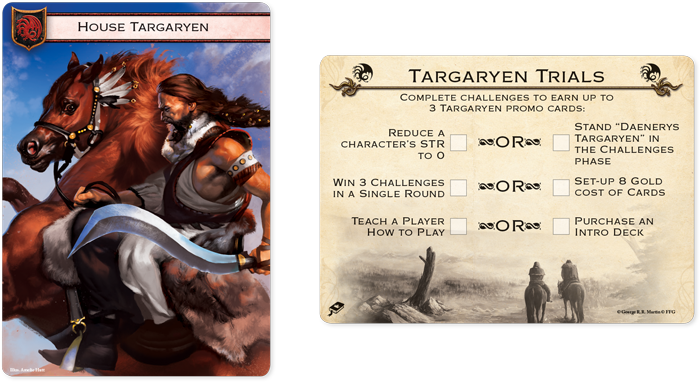 On the back, you'll find a list of three pairs of trials (as depicted on the Targaryen Trials card below). Tackling your faction's trials will lead you step-by-step into the event and the game. More than this, your trials will be rewarded. Completing one of the trials in a pair earns you an extended art card for your faction, and if you complete one trial from each of the pairs, you'll walk away with a complete playset of these gorgeous promo cards. Simply purchasing an Intro Deck will earn you one extended art card, as will teaching a player how to play. These are easy ways to earn the event's prizes, but that's the goal. This event is all about showing up, learning, and enjoying the game. And this first trial rewards you simply for participating. The second challenge leads you into some of the game's core mechanics. You'll have to understand how the Challenges Phase works to win three challenges in a single round, and you'll want to learn the rules for taking a mulligan in order to improve your chances of setting up eight gold cost of cards. Either way, this second pair of trials doesn't just draw your focus to the mechanics unique to A Game of Thrones: The Card Game; it also highlights your deck's strengths. You will need to learn about your cards to complete either of the second pair of trials. 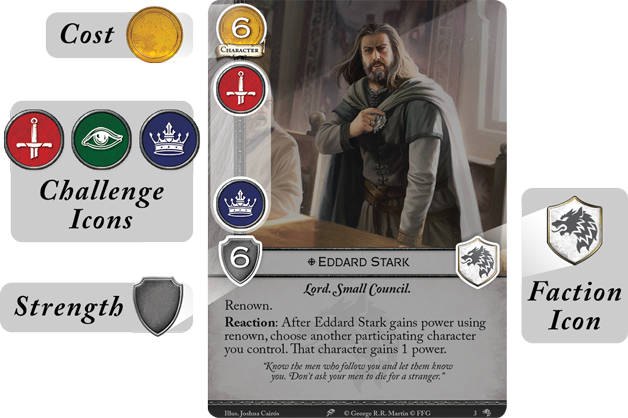 Later on, if you're attending this event as an introduction to A Game of Thrones: The Card Game, you may review your Intro Deck when you decide to try your hand at deck-building, and you'll be able to recognize the cards that worked as you declared and defended your challenges. You'll also be able to survey the various card costs and consider how they allowed you to set-up with a strong initial board position. More than the other trials, the trials from this third and final pair will challenge you to explore the different possibilities hidden within your Intro Deck. In doing so, you'll see how your deck—and the game—gives life to the characters and events of George R.R. Martin's A Song of Ice and Fire. You'll crush your foes on the battlefield with cunning ambushes. Your spies will help you keep one step ahead of your opponents' machinations. And for each of the trials you complete during the A Game of Thrones: The Card Game Intro Event, you'll earn one copy of your faction's extended art promo card—up to a maximum of three (a complete playset). The A Game of Thrones: The Card Game Intro Event is your chance to get into the game—or to help others discover all the joys and drama accompanying the battles, intrigues, and politics of Westeros. 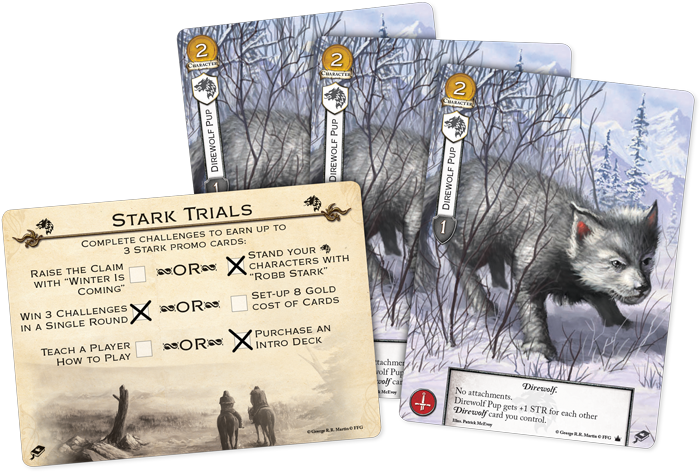 Each A Game of Thrones: The Card Game Intro Event Kit is designed to support up to sixteen players, so be sure to talk to your favorite local game store to see if they're participating, learn how you can help promote the event, and make your plans to attend. Fun and prizes await you at the A Game of Thrones: The Card Game Intro Event!